The dual city of Budapest, made up of Buda on the western bank of River Danube and Pest on the eastern bank is one of the most sought after travel destinations in Europe and quite rightly so. 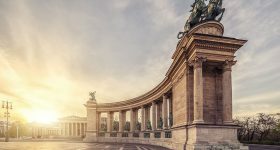 Dubbed the ‘Paris of the East’ & ‘Pearl of the Danube’, venturing through Budapest’s rich history, unique cuisines, rustic ruins and thermal bathhouses is every travelers’ dream. 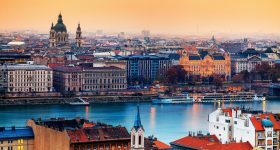 To make those dreams come true in the most beautiful manner, here’s your all encompassing Budapest Guide that will talk about everything from the country’s currency, festivals you ought to attend and tipping culture. Budapest has struck an impeccable balance between the dynamic and slow life. The Pest half of town is lively and upbeat with parties that go on till dawn while Buda is the indolent half who is ideal for a lull stroll and panoramic views. This allows travelers to experience both the extremes without stepping out of the city , making for an ideal vacation. However, much of Budapest’s charm lies in the unexpected glimpses of the densely lush courtyards and glimmered vistas down cobbled streets. 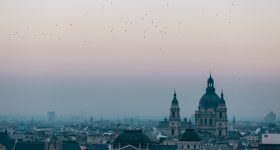 Jotted below are a compact list of 10 things you should absolutely do in Budapest, even if you are in the city for just 24 hours. We know just how to fit all of these things into a 1 day itineraryand if you're wondering how you can take a quick look! The best time to visit Budapest is anytime between April to September as the temperatures average between highs of 21°C and lows of 15°C. However, Budapest experiences occasional showers during summer, so it is advisable to carry a raincoat if you’re heading here in summer. Moreover, many festivals happen during this period, like the Sziget Festival held in August which makes one’s visit all the more enjoyable. Winters in Budapest can get very chilly and and temperatures hover around freezing. Budapest also receives a good amount of snowfall , hence visiting Budapest during this period is not really recommended. You can check out the current weather in Budapest here and make plans accordingly. It is very much possible to backpack through Budapest on a shoestring budget, but you may need some expert hacks and tricks to do so. Here are a few we found useful. 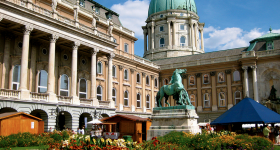 Unlimited Savings are the 2 words that aptly describe the Budapest Card. With a 24, 48 and 72 hour variant , the Budapest card is an absolute saver when it comes to discovering Budapest on a budget. You can use free public transportation and and gain considerable discounts for many sights, attractions and programmes around the city. We have gone to the extent of doing a cost benefit analysis of the card here and you must check it out to see how much you can save by buying this €22 card. 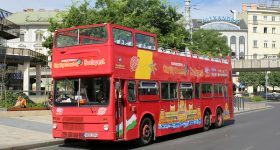 If you want to see the complete list of attractions you get access to with the Budapest card, head here. If you’re looking to do touristy things, the super efficient and well very connected Hop On Hop off tours has your back. You can just pick and choose the places you want to travel to, see the lines they fall on and buy €22 pass that will take you all around the city with just that. Be it a bus or boat that you intend to see Budapest on, the economical HOHO is your best bud. Many of Budapest’s iconic landmarks don’t have an entry fee. 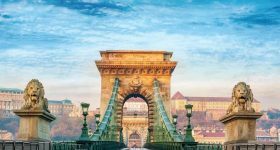 If you’re on a stringent budget, then choose to visit just these and you’ll have seen a good amount of Budapest anyway. 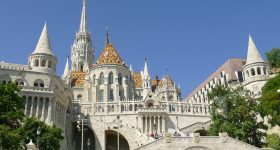 Some of the free attractions in Budapest are St Stephen’s Basilica, Margaret Island, Fisherman’s Bastion, Heroes' Square and the Chain Bridge. You can also admire the Budapest Parliament and Buda Castle from the outside for free. Also, many museums around the city offer free entrance on selected days. Check out the official websites of the museums you wish to see to know when these dates are. Avoid the tourist trap restaurants and go for the unsung tiny ones where you see locals flocking in. These are likely to be reasonably priced and are definitely more authentic than the best rated ones on Tripadvisor. Go to the Great Market Hall and shop for groceries and food-to-go like the popular Hungarian Langos and enjoy your meal in a scenic surrounding. Light on the pocket and your tummy! Like they say, you get more bang for your buck from the most modest stall, so hunt for that and go light on your pocket and tummy!. Budapest has some of the most charming hostels that are hotel standards, but hostel priced. This allows luxury on a budget and since most tourists choose to stay in such places, it makes for amazing company too. Some of the popular and recommended ones are : Pal’s Hostel & Apartments, Lavender Circus Hostel, Animation City Hostel, Treestyle Hostel, Fifth Hostel and GoodMo House. Check out this tools to help you further budget your Budapest trip. Budapest has a dense network of ATMs that accept most international debit and credit cards ( Visa, MasterCard, Plus, Maestro, Cirrus & others). Most establishments around Budapest, barring the mom and pop stores around the city accept card payments too. You will also see a sticker outside shops and restaurants that accept card payments. If this sticker is not present, it is advisable to check with the store management about card payments before making a purchase.Though Hungary is a part of the European Union, it hasn’t adopted the Euro as currency hence getting your euros exchanged in Budapest will give you a scant exchange rate. It is better to carry enough liquid cash in HUF and use your card for the rest. 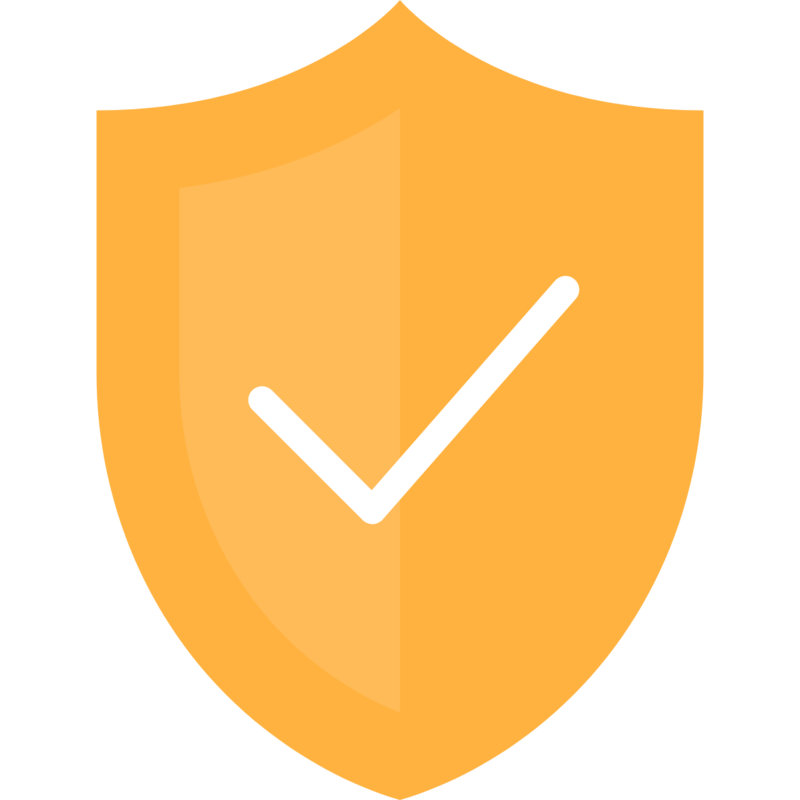 Here’s a trusted exchange calculator you can use to check the current exchange rate of HUF to your home currency. Though the tipping as a practise is not ingrained in the city culture, you can add about 10% on the bill if you wish to tip. Most places have a service fee included in the bill. However, tipping is not considered demeaning so you can tip your driver, waiter or hairdresser and they will not shun it. In this Budapest Guide, we will delve briefly into the important festivals in Budapest so that you can plan your visit to Budapest around these celebrations. Be it music festivals, local food fairs, national festivals or art shows, festivals go on year round here, so bookmark these and add them to your calendar so that you can pop by and taste a bit of Hungarian culture. 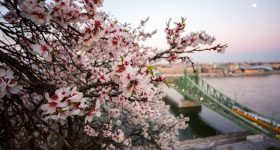 Budapest hosts 7 annual festivals namely Sziget Festival, Budapest Spring Festival, Café Budapest Contemporary Art Festival , Budapest Wine Festival, Budapest Pálinka Festival and Budapest Pride. One of the biggest festivals to look out for is the Sziget Music Festival which brings together a melange of music, theater, circus, art, culture, spirituality and sports, all with a massive spirit! Beer festivals in Budapest are also mightly jolly, so if you're a beer lover, you should definitely head to to the Beer Week, Craft beer festival, the Buda Castle Beer festival or the good ol' Oktober Fest. For a detailed monthly festival guide, you can head to this website or here. Though most of he practises in Budapest are similar to that of the rest of Europe, one peculiar thing most outsiders don't know about this city is that Hungarians do not clink their glasses before drinking beer. Intriguing that a country so famous for its beer does not believe in clinking glasses right? You can clink any other drink, but make sure you don't clink your beer mug! Budapest locals are extremely friendly and cheerful so be prepared to smile and be greeted a lot.Make sure to learn a few phrases from below to greet them back ! Despite their merry nature, the citizens of Budapest are known to be highly spiritual.They value their traditions dearly, hence be careful not to hurt their sentiments. This hearty snack is basically a deep fried flat bread that has generous portions of mashed potatoes, sour cream yogurt, grated cheese, ham or sausages (or all of them together) in the center. Lángos is an afforable savoury treat and the best ones are made at Central Market Hall. Also called Chimney Cakes, this dessert delight is made from sweet yeast spun and wrapped around cone-shaped baking material and brushed with butter. It is then slathered with a whole lot of cinnamon, ground walnuts and caramel making it irresistible. They are most popular during festivals,especially Christmas. However, you find good Kürtőskalács in tiny stalls on Andrássy Avenue and Bajcsy-Zsilinszky Street. Popularly called Hungary's national dish, Goulash is a Hungarian dish made from meat stew cooked with onions, paprika, tomatoes and pepper. It is accompanied with fresh white bread and chopped hot paprika on the side. It was traditionally a peasant dish prepared on iron cauldrons over wood fires. It is said that the real taste of Goulash comes with this kind of preperation and certain restaurants still undertake this tiresome process to make quality Goulash. This semi-soup ochre dish earns its name from the copious amounts of paprika used in its preperation and stewed tender chicken leg. Chicken Paprikash is eaten with with sour cream and spätzle, a pasta-like dumpling. It's hearty and the ideal comfort food. This Drummer Cake made up of between 5 sponge layers, each spread with chocolate buttercream and topped with a thick layer of caramelized sugar is a sugary treat that everyone in Budapest devours quite often, occasion or not. The sides of the cake are usually coated in ground nuts like hazelnuts, walnuts or almonds and you get the best Dobos Torta in Fröhlich Cukrászda, a kosher bakery in the Jewish quarter that has been baking traditional cakes for over half a century. Budapest has some really fun modes of public transport like the Cogwheel railways, Buda Castle Funicular, Zugliget chairlift and even a Children’s Railway ( operated by children). This is of course barring the usual modes of tram, buses and railways. This PDF here is your one stop guide to the public transport network in Budapest and we'd suggest you download it, print it and keep it dear and close! A few other things you must know about the Budapest Public Transport system is that most of them shut by 11 PM and post that your only mode of transport are the good ol' pricey cabs. There are few night buses , but they are not as frequent and well connected. Maximum pick pockets happen on these public transports, hence keep a close eye on your belongings. Travelling without a ticket on any of these transports can be heavy on your pocket. The fine can be anything between HUF 6000 to HUF 10,000. The inspector also has the right to ask for your passport if and when you're caught or any offical id. Budapest Ferenc Liszt International Airport (BUD) commonly called just Ferihegy, is the city’s international airport located 16 kilometres southeast of Budapest. Though it cannot be called well connected, it offers international connections to Europe, North America, Middle East, Africa and certain parts of Far East. They have a very active Facebook page which you should totally check out for no reason at all! 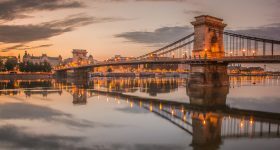 You can take the first step towards your Budapest trip by checking the prices for tickets to from your home country either on Skyscanner or Expedia. The airport houses all the facilities including ATMs, free wifi,restaurants, duty free shops and car rentals like Avis, Budget, Dollar, Alamo, Europcar, Hertz, National and Thrifty. 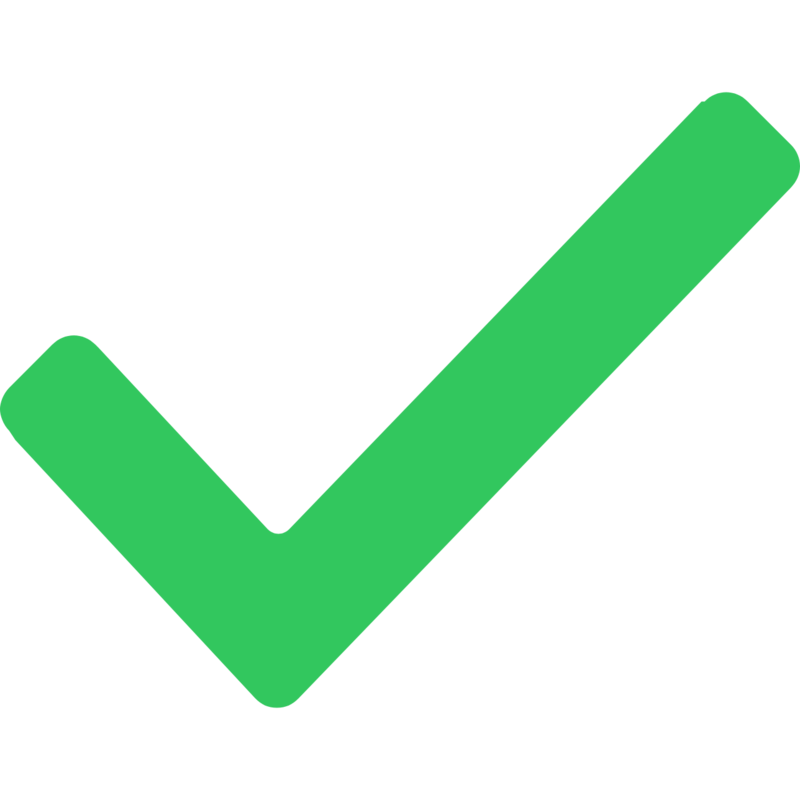 There are 2 official airport transfer modes from Budapest Ferenc Liszt International Airport (BUD). The Airport Minibus which is a shuttle bus or the Airport Taxi called Főtaxi. You can pre purchase a ticket or buy a ticket from the counter for the the airport minibus offers at a flat fee to anywhere in the city. Airport taxi on the other hand is a private service that costs much more than the airport minibus but takes you to your destination faster with more privacy. If you’re up for public transport, you can try the Hungarian State Railway (MÁV) which connects to the city centre. You can check the routes here. You can also take a bus from the airport to the Kőbánya-Kispest metro station in the city. Their official website is extremely user friendly and details almost everything you could possibly need.